Use the mathematical formula for a continuous-time chirp signal $$ x(t) = \cos( \pi\alpha t^2 )\qquad 0\leq t \leq T $$ to define a signal whose chirp rate is \(\alpha\)Hz/s, whose duration is \(T\) seconds. Produce a discrete-time signal by sampling \(x(t)\) at a rate \(f_s\) samples/s. This is done by evaluating \(x(t)\) at \(t=n/f_s\), and is, in effect, a C-to-D converter. The result is \(x[n] = x(n/f_s)\). 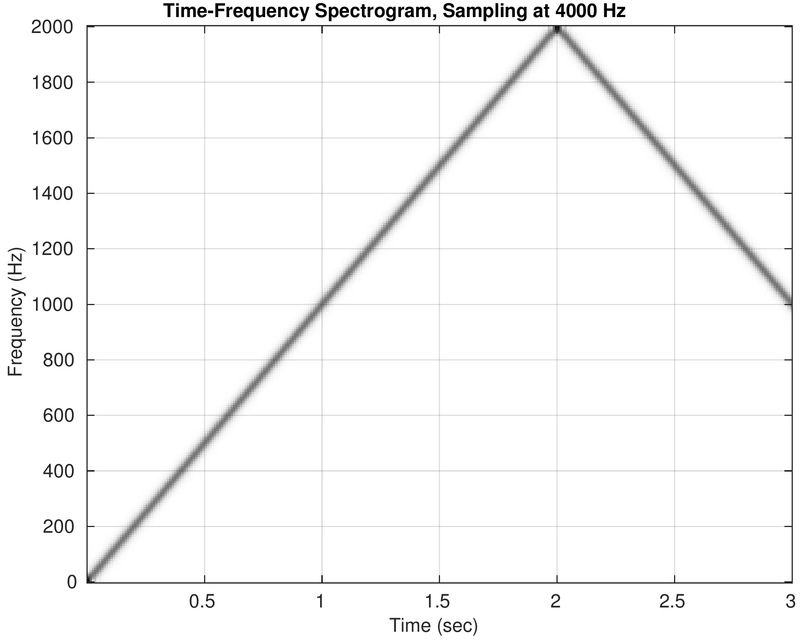 Use Matlab's soundsc function to play the signal for listening. This is the D-to-C conversion component because a continuous-time signal must be created from \(x[n]\) in order to drive the audio output, i.e., the speakers. Evaluate and display the spectrogram of \(x[n]\), which gives a visualization of what we hear. 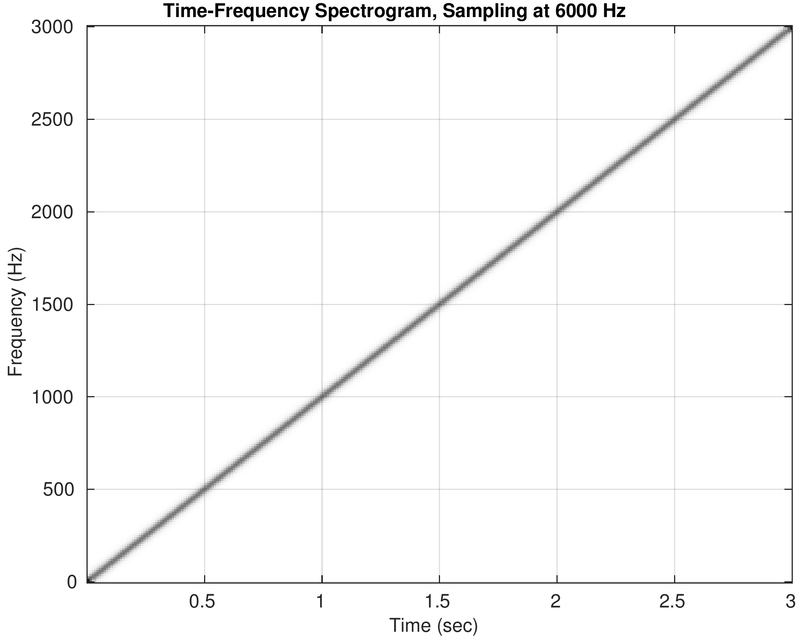 In the demo, the chirp rate is \(\alpha = 1000\) Hz/s, and the time duration is \(T=3\)s, so the instantaneous frequency \((f_i(t) = \alpha t)\) goes from zero at \(t=0\) to \(3\alpha = 3000\)Hz at \(t=3\)s. Since the highest frequency in \(x(t)\) is \(3000\)Hz, there should be no aliasing if \(f_s\geq 6000\)Hz. 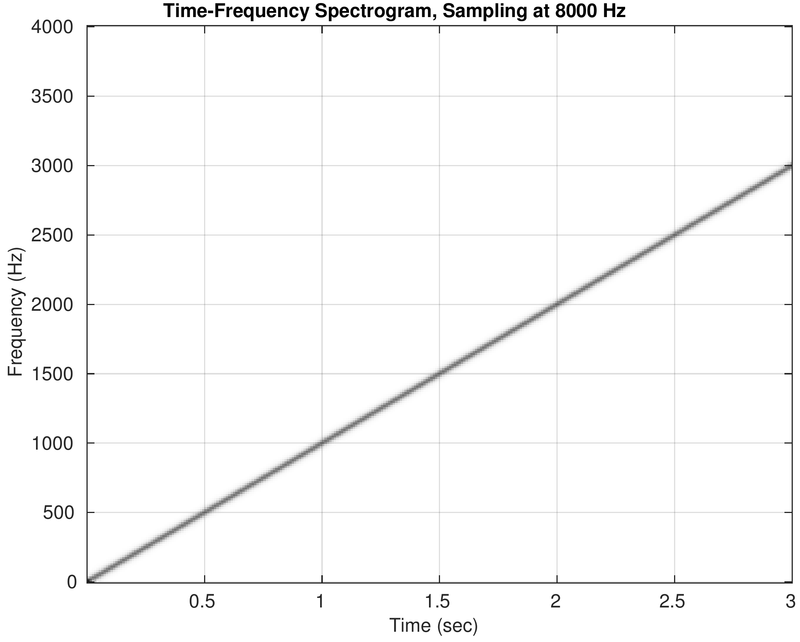 The demo shows what happens for five different sampling frequencies: 8000, 6000, 4000, 3000, and 2400 Hz. 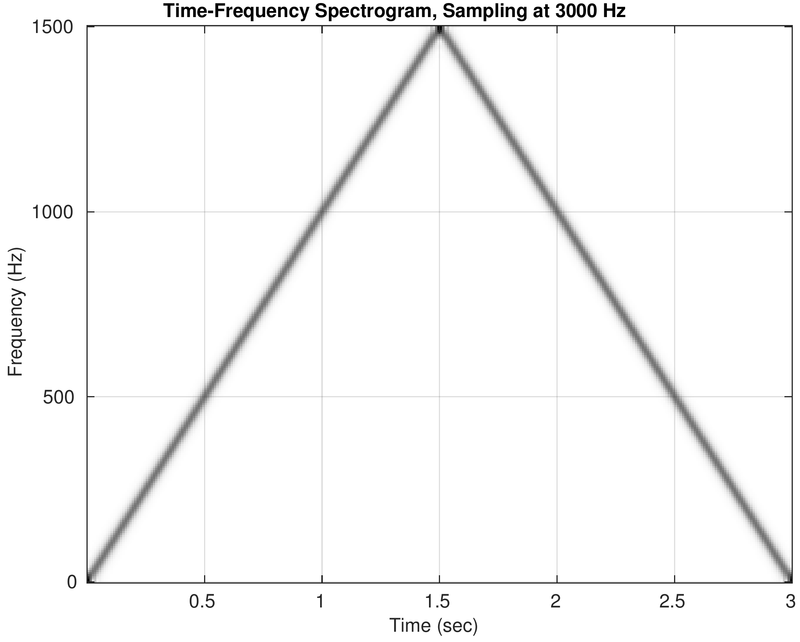 The first two cases exhibit no aliasing and the sound rises from 0 to 3000 Hz. 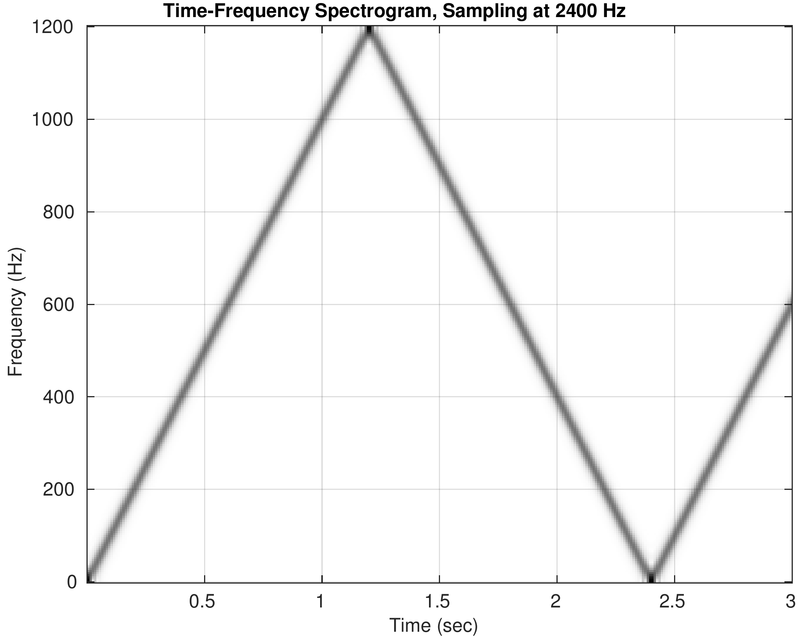 In the last three cases, the sound goes up and down because \(f_s/2<3000\)Hz. When \(f_s=4000\), the maximum output frequency is \(2000\)Hz, for \(f_s=3000\), the maximum output frequency is \(1500\)Hz, and for \(f_s=2400\), the maximum output frequency is \(1200\)Hz. Spectrograms for the five cases are shown below. Click on the spectrogram to hear the corresponding chirp. Note the different \(y\)-axis scales for frequency. When you listen to the sounds, try to follow the ups and downs that match the spectrograms.